Kohlrabi is a good-for-you cruciferous vegetable low in calories and high in antioxidants and fiber that is a popular go-to side dish in Hungary, Lithuania, Poland, Russia, and Ukraine. When stuffed, as in this Hungarian recipe (Töltött Karalábé), it's reminiscent of stuffed cabbage rolls. Ground beef or a combination of beef and pork, or beef, veal, pork, and lamb, or any combination thereof can be used, and leftover cooked ground meats work as well. Kohlrabi can be used for a totally vegetarian dish by stuffing it with well-seasoned grains like millet, barley, buckwheat groats, rice, sautéed onions, and mushrooms, or whatever whim strikes you. Parboil kohlrabi for 20 minutes. Cool until they can be handled. Peel away the tough, outer skin. Cut a bit off the root end so they will stand straight. Cut off the tops and reserve, and scoop out the flesh of the bulbs, leaving at least a 1/4-inch wall, and chop it finely. In a medium skillet, sauté onions and chopped, scooped-out kohlrabi in 1 1/2 tablespoons butter until tender. Transfer to a large bowl, and combine with 1 pound meat of choice, 2 large eggs, 1 finely chopped garlic clove, and salt and pepper to taste. Heat oven to 350 F. Coat a casserole dish with cooking spray. Fill hollowed-out kohlrabi with meat mixture, place in dish, and place kohlrabi tops on. Pour the 1 1/2 cups broth of choice over the kohlrabi. Bake 40 to 50 minutes or until tender. Remove kohlrabi to a serving platter and keep warm. Skim fat off pan juices. Fork blend 1 cup sour cream with 2 tablespoons all-purpose flour. Temper with a few ladles of hot pan juices, whisking constantly. Pour tempered sour cream into pan juices and cook until thickened. Adjust seasonings, if necessary. 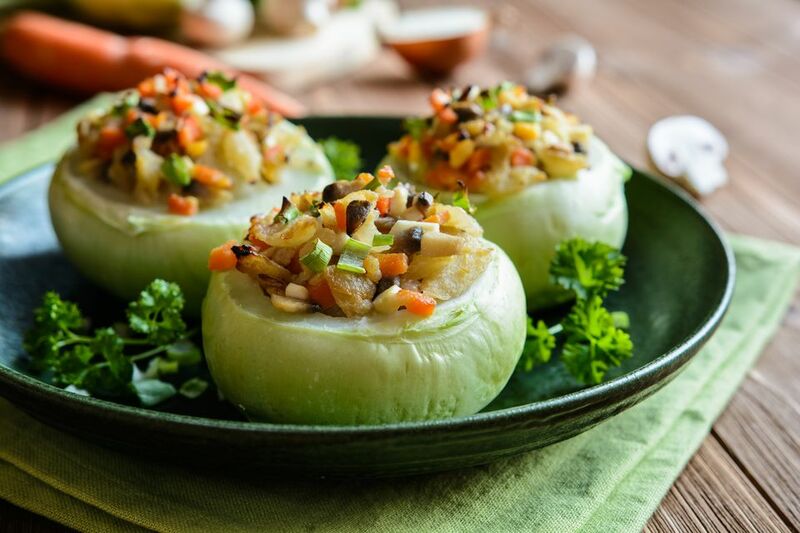 Serve stuffed kohlrabi with sauce on the side or ladled over.